Our Wedding Collection features a carefully curated set of premade designs, ready for your customization. Ink colors, wording, envelope and paper colors are all customizable. If you do not see your perfect invitation suite and are looking for a custom design, please contact us or fill out this form. Browse our collection of wedding invitations and select the designs most fitting to your wedding day. Each suite has been designed to accommodate numerous of colors and printing options. There is a large variety of materials, colors, and designs. We recommend ordering a sample pack of the suites to determine which options are best suited for you. Once you have chosen your perfect design, place your order and during checkout you will provide all of your wording and details. It is important to have your wording proofread and spellchecked when you submit your order; we are also happy to provide wording assistance if requested. We suggests you to order at least 10 extra invitations. This will protect you from any damaged stationary, last-minute add-ins, addressing errors and more. Plus, they make lovely keepsakes. Your initial proof will be sent within 3-4 business days, and you will either approve your proof as is or make changes (Two round of changes are included; additional proofs are available for a fee). Once you approve your design, printing will begin. For digital printing, most orders ship in 1-2 weeks; however, for non-standard paper & color envelopes, it may take 3 weeks. Foil average around 5 weeks. Rush printing options are available - please contact us. Transit time is 2-3 days for domestic with Swiss B-post and 7-10 days for international. 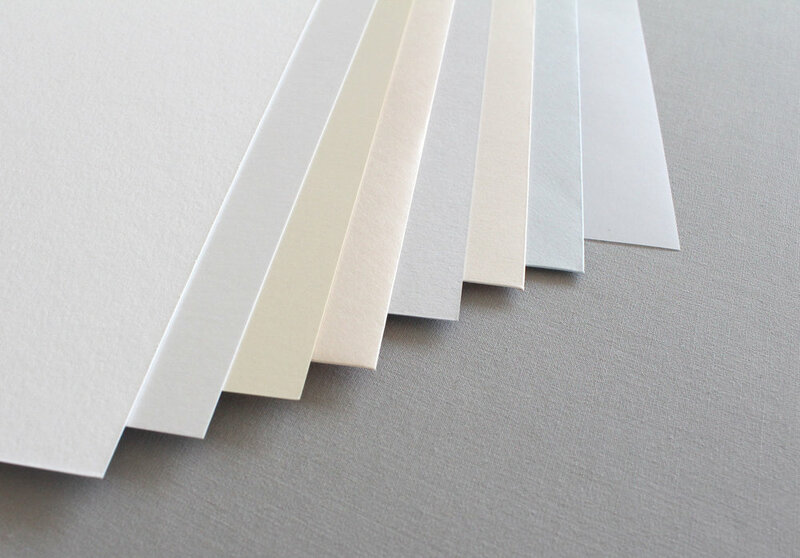 Our standard paper is a luxurious Cotton Linen White Cream and is soft to the touch. Available in Crystal, Ivory or Coral, has a shimmer, pearlized finish on both sides. Available in Pale Grey, Soft Coral or Pale Blue , and is soft to the touch. Translucent material, a semi-transparent paper made from rag or plasticized cotton. Available on request only. Each sheet is individually made by hand and eco friendly. The handmade paper is made from 100% recycled cotton rag, is acid free, chlorine free, and bleach free. To coordinate with our design style, you can choose from the envelope colors below. Below you will find our standard digital ink colors. Please note that these colors will vary from monitor to print. Custom colors can also be accommodated. Our silk ribbons add an elegant touch to your wedding invitation suite. A ribbon is wrapped around and tied in a bow. Ribbon may be used to close a vellum jacket, hold together a set of cards or simply add decoration for a single card. A perfect way to hold your cards together! These can be blank or customized with your names & wedding date. Paper colors available are the same as the colors above. To coordinate with your design, we also offer simple custom map drawings, which are perfect for a destination wedding! Pricing begins at $100 for 3 streets & locations, and each street/location is $25. Our sheer vellum paper can be a large belly band style (known as a jacket). Note that vellum is delicate, so you will be able to see through the paper. To hold your Invitations pieces all together, such as RSVP, Details Card, Info Card. Perfect for a destination wedding or an organized bride! $2 per piece, available in two sizes Signature and Quadro. We offer two types of wax seals our in-house collection pricing starting at $32 for 25 pieces or a custom seal design (you keep the seal) pricing starting at $125 for 25 pieces. In-House wax colors: Antique Gold, Rose Gold, Silver, Black, White. Other colors available on request for an additional fee. We offer two different paper edging options, traditional square corners and hand-torn edging. All of our Suites come with square corners. Hand-torn edging additional fee of $1.25 per piece. Please carefully review all information and design selections before placing your order. The design process begins immediately after your order is placed and approved. Design change requests after an order is placed will bring upon oneself a 20 percent fee of the order(s). Changes to paper and envelopes will bring upon oneself a $100 restocking fee. After your final proof is approved, printing and production begin immediately. Please carefully review your proofs. Any changes after the final proof is approved, will bring upon oneself a 100 percent fee of order(s). However, after proof has been sent to the printer, quantity changes are no longer accepted without a $150 adjustment fee. Quantity adjustments may impact the delivery date. By approving the digital proof provided by Blattpapier Studio, you accept responsibility for the layout and text precisely as shown. Any errors discovered after this point are solely the responsibility of the client. Once approval has been given, your designs proceed directly to print production and may not be changed. Any changes required after this point will incur fees. Under no circumstances will Blattpapier Studio be responsible for incorrect text that has been approved by the client. If errors are discovered after proof approval and you wish to reprint, we are required to charge you for services rendered. The customer will be responsible for the reprinting at a 30 percent discount of the original cost of the item(s). Reprints requiring a rush order are subject to the additional fees. Due to the nature of the product, Blattpapier Studio cannot offer refunds or exchanges of any kind. If you would like to increase your order, We would be happy to send out a separate invoice. In the event that your prints do not match the approved proof, Blattpapier Studio will take full responsibility for any and all re-printing costs. Errors will be corrected promptly and free of charge.